Dillistone Funeral Directors in Littlehampton, West Sussex, is here to provide comfort at what is a difficult time. We will arrange a funeral that celebrates the life of your loved one in a dignified and heartfelt way, providing sympathy and understanding throughout. Our funeral home can be found on the Arundel Road, Littlehampton, placing us at the heart of the community. We are ideally placed to serve localities such as Rushington, Wick and Toddington. Our location also makes us easily accessible to surrounding areas, including Climping and Lyminster. Offering support in a time of need, we will ensure the wishes for your loved one’s funeral are fulfilled. Whether you intend a religious, non-religious, traditional or more contemporary ceremony, we are a funeral directors that will make it possible, without compromising on any detail. Our aim is to help ease the emotional burden. We achieve this through the service we offer and a commitment to providing a farewell that honestly reflects what your loved one meant to you in life. Established in 1986, we have provided a compassionate service to our community ever since. Our chapel of rest offers a private and peaceful space in which to spend time with your loved one and our dedication to meeting your needs means we will open it outside normal hours when required. 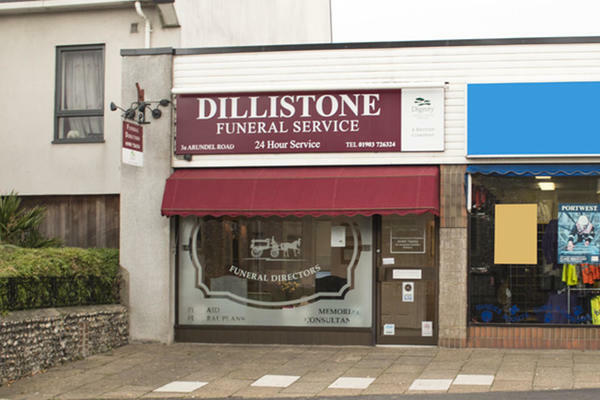 Dillistone Funeral Directors is available 24 hours of the day. When you feel you are ready to talk, we will be here. Call us today on 01903 726324 to talk through your personal requirements. At Dillistone Funeral Directors, we understand how special life is with those that you love. For us, every funeral is unique and personal. We have a service to fulfil every wish, with every detail carried out with the same uncompromising quality of care. From a traditional service, to a colourful woodland burial, your options are limitless with our Full Service Funeral. If you have a little more flexibility when it comes to arrangements, then we can provide a Simple Funeral for a lower cost. Our staff are available 24 hours a day on 01903 726324 if you require our services outside of these hours.